Macrophages and tuberculosis vaccine. 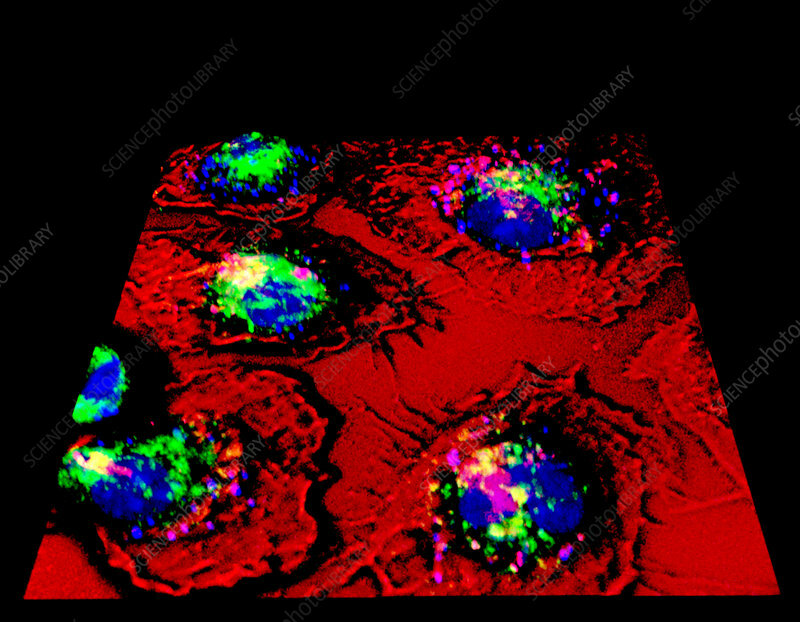 Fluorescence light micrograph of macrophage (red, outlined in black) white blood cells that have phagocytosed (engulfed) Mycobacterium bovis bacteria (pink). The phagocytic vesicles are green. DNA (deoxyribonucleic acid), from both the macrophage and the bacteria, is blue. This is the BCG (bacillus of Calmette-Guerin) strain of the bacteria, used in the vaccination for tuberculosis (TB). The bacteria is live but attenuated (weakened). The macrophage destroys the bacteria. The vaccine primes the immune system, without causing disease, so that it responds more rapidly if infected with TB bacteria.